Team Mercedes was victorious for the fifth time in Sochi after its two drivers swept the top two steps of the podium at the 2018 Formula One Russian Grand Prix. The race was won by Britain’s four-time World Champion Lewis Hamilton and it was his third victory here in Sochi after the F1 World Championships came to Russia in 2014. 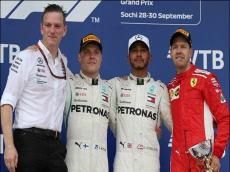 His Finnish teammate Valtteri Bottas finished the race second and Ferrari’s Sebastian Vettel, who is also the four-time F1 world champion, completed the trio of winners.